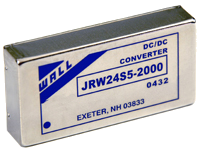 The JRW series of DC/DC power converters provides 10 watts of output power in a 2.0 x 1.0 x 0.4 inch industry standard package and footprint. This series has single and dual output models with 4:1 ultra wide input voltage ranges of 9-36VDC and 18-75VDC. Some features include high efficiency up to 84%, 1600VDC I/O isolation, and six-sided shielding. This series is also protected against over voltage, over load, and short circuit conditions. This series is RoHS and UL94V-0 compliant and has UL60950-1, EN60950-1, and IEC60950-1 safety approvals. 2. The on/off control pin is referenced to –Vin. To order positive logic remote on/off, add the suffix “P” to the model number (Ex: JRW24S15-660P). To order negative logic remote on/off, add the suffix “R” to the model number (Ex: JRW24S15-660R). 3. “I” type models are more efficient; therefore, they can be operated over a more extensive temperature range than the standard version. 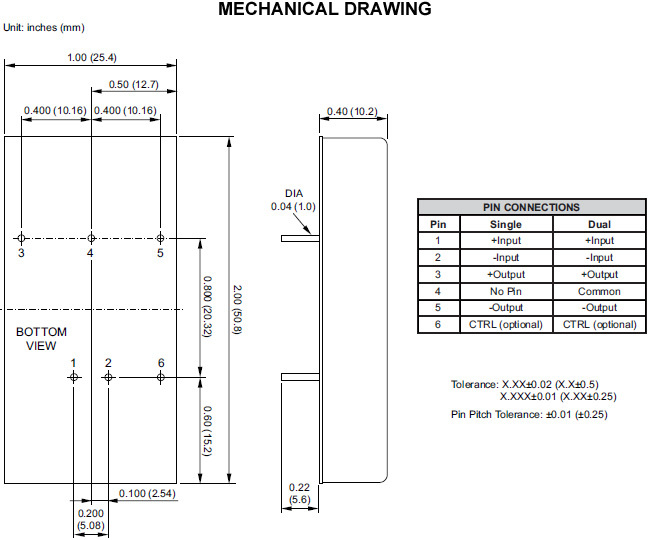 To order extended operating temperature range, add the suffix “-I” to the model number (Ex: JRW24S15-660-I). 4. Heatsink is optional and P/N: 7G-0020C-F.
7. CAUTION: This power module is not internally fused. An input line fuse must always be used.